Daniel is studying Biomedical Sciences with a pre-med concentration. He said he first learned of Auburn University through a school recruiter and was impressed with what the school had to offer. Although Daniel plans to pursue a medical degree, he said he is unsure of his specific path and plans to attend graduate school first. He said he plans to gain as much experience as he can in the United States before moving back to Nigeria to help fill the need for experienced physicians. Daniel said in his home state, there is one hospital serving three communities. While pursuing his degree, Daniel also works as a tutor through Study Partners, and is currently conducting a research fellowship. His favorite way to spend his free time is playing soccer. 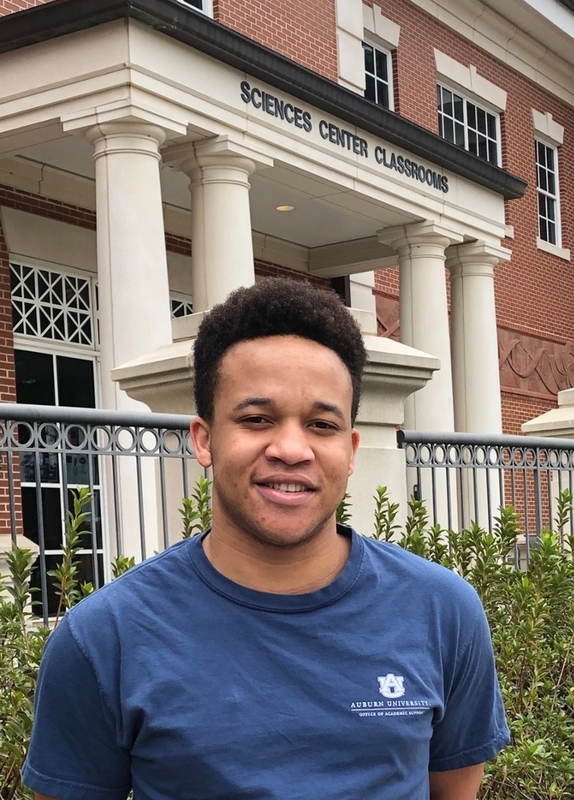 Daniel added that a major part of his positive experience as a COSAM student has been through the Office of Inclusion, Equity, and Diversity … specifically Director Dr. Kimberly Mulligan and Administrative Support Specialist Janice Brown. “They have pretty much been my whole support in COSAM,” Daniel said. Although Daniel is a long way from home, he said he doesn’t have the time to really be home sick. Daniel said his advice to incoming international students would be to set daily goals. COSAM Senior Daniel E. Akwa.